Young boys standing in front of damaged buildings in Saada, Yemen, where bombing has left many neighbourhoods in the city are strewn with wreckage and debris following ground fighting between armed groups. “Outraged” by the “unconscionable toll” caused by the escalation of hostilities in Yemen, the UN human rights chief, Michelle Bachelet, on Saturday, urged the warring parties and those supplying them with weapons, to take immediate steps to end the suffering of civilians. “The Saudi-led coalition and pro-Hadi forces, the Houthi forces – and those who supply arms or other support to the parties to the conflict – all have the power or the influence to stop the starvation and killing of civilians, to give some reprieve to the people of Yemen,” UN human rights Commissioner Bachelet stated. Conflict in the country has its roots in 2011, but the situation escalated dramatically in 2015, when a Saudi-led coalition was invited by the internationally-recognized Government to intervene, uprooting millions and destroying civilian infrastructure across the country. According to information received by the UN Human Rights Office (OHCHR), at least 110 airstrikes were carried out in Al Hudaydah, Sa’ada and Sana’a between 31 October and 6 November. In the past four days, conflict has continued to intensify, with coalition warplanes hovering at low altitude over Al Hudaydah city since Thursday morning, Houthi forces firing anti-aircraft missiles and mortars, and violent street clashes ongoing. At least 23 civilians have been confirmed dead in the governorate since 24 October, but the total death toll is believed to be much higher. About 445,000 people have been internally displaced since early June. 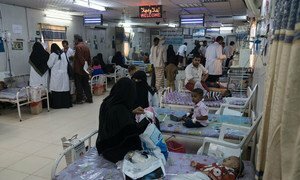 OHCHR noted there are also serious concerns about the fate of 900 detainees in the Central Prison and six pre-trial detention centres in Al Hudaydah city; the Central Prison was hit on Monday morning by two mortar shells, injuring five people, and cutting off power and water to the facility. Armed confrontations are also reportedly taking place very close to the main hospital, Al Thawra. Ms. Bachelet called for an immediate end to the military escalation, as catastrophic levels of food insecurity could soon threaten the lives of 14 million people across the country. She urged the Saudi-led coalition to immediately remove restrictions on the safe and expeditious entry into Yemen of indispensable humanitarian supplies and other goods. “The parties to the conflict must allow the free, regular and unimpeded passage of food and other humanitarian relief and must not take actions that would deprive civilians of their rights to food and health,” she stressed. The High Commissioner called on “all those with involvement or influence in the conflict to facilitate the access to humanitarian relief that the people of Yemen so desperately need”. “I also remind States that the Geneva Conventions stipulate that all States, including those not involved in the armed conflict, have the obligation to take measures to ensure respect for the Conventions by parties to a conflict,” adding that ”conditioning, limiting or refusing arms transfers” is one measure that could be taken. Since conflict escalated in March 2015, OHCHR has counted a total of 17,640 civilian casualties in Yemen, including 6,872 dead and 10,768 injured. The majority of these casualties – 10,852 – resulted from airstrikes carried out by the Saudi-led Coalition. For those having survived the repeated attacks, access to basic services and sources of income has become increasingly challenging. Today, three quarters of the entire Yemeni population – 22 million women, children and men – find themselves dependent on some form of humanitarian assistance to survive. Efforts are being made to step up life-saving aid from eight million, to 14 million stricken Yemenis a month, the World Food Programme (WFP) said on Friday, before urging warring parties to spare the key Red Sea port of Hudaydah, which is a lifeline for the whole country. 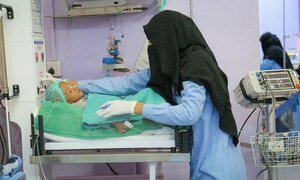 Intense fighting near a major hospital in the Yemeni port city of Hudaydah has put scores of children at “imminent risk of death”, the United Nations Children’s Fund (UNICEF) warned on Tuesday, calling on the warring parties to stop hostilities near the medical centre and allow those in need to safely access treatment.